nterventions© is the name I came up with to describe in a word the very personalized collages I make with photographs and portraits of “real” people, i.e. you, for example. The technique I use is the same as with my collages and other paintings, but this time, it is you (or your loved one) who is the main character of the story told. The works posted here are based on portraits and photos from a friend photographer, Carlos Guzmán, and collected personal pictures and stories from the clients. 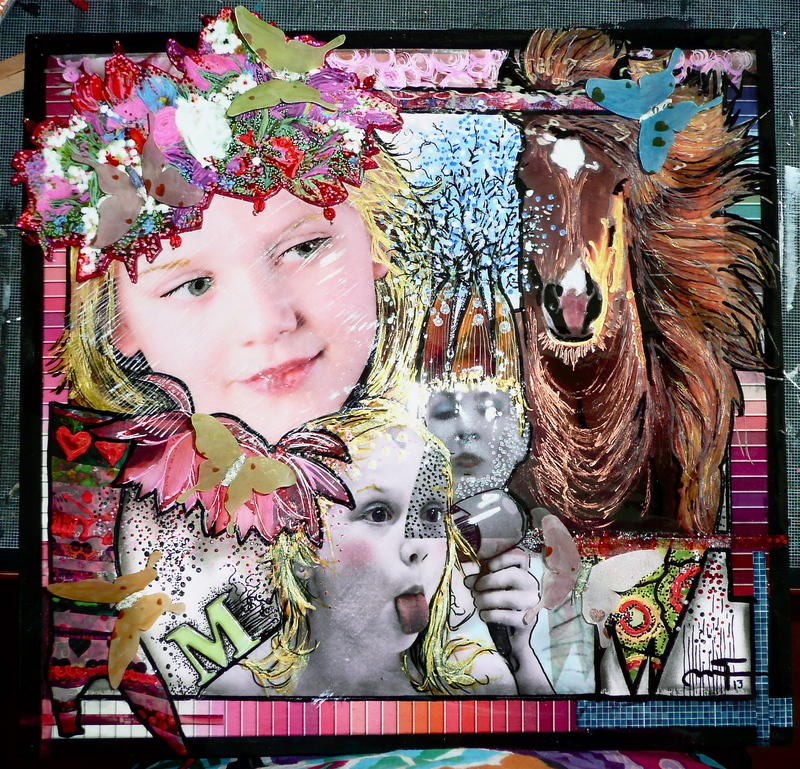 Each collage is personalized, and tells its own story about the leading character. I usually ask the client some key personal questions, so their answers become part of their collage as symbols and codes. To see the gallery, please click here. How do I customize my Interventions © for you? hese portraits are a reflection of your reality. It is customized art, art a la carte, so to say. You provide me with a couple of good photos and a story (hobbies, main likes and tastes, special treats) of yourself and/or your dear beloved, and I will make your/his/her story come to life in technicolor, as a visual, artistic representation. What better way to decorate a special wall? What better way to make a very special present to a loved one? urprise a loved one with a perfect, personalized gift. You provide me with the details, and I will bring, carefully and lovingly, your story to the canvas. for a single portrait (40×60 cm). for a family portrait or a larger size portrait it is about two or three weeks, depending on the size and the number of people portrayed. € 170, and € 230. Prices of any format may vary depending on the size and the numbers of characters portrayed.